For thousands of years, the Dead Sea has been renowned world wide for its therapeutic and healing properties. The special salt found in the Dead Sea is what gives the water it's high mineral content and healing properties; Dead Sea Salt contains around 21 minerals in total, including magnesium, calcium, sulfur, bromide, iodine, sodium, potassium and zinc, to name a few. Dead Sea Salt is often used in skincare and cosmestic lines because of the beneficial effects it has on skin. Explore our usage suggestions and find a new way to pamper yourself. Dissolve approximately 2 cups of Minera® Dead Sea Salts into a warm bath and soak for at least 20 minutes. Use 3-4 times a week for a period of 4 weeks for best results. Be careful not to bathe with water that is too warm as this will decrease the benefits. The idea is to re-create the waters of the Dead Sea in your own bath tub. Pour a large handful of Minera® Dead Sea Salt into a warm running bath and soak for a relaxing and detoxifying soak. Settle in to relieve stress, stiffness, and ease muscle aches and pains. Try adding a few drops of your favorite essential oil to create a unique bath soak. 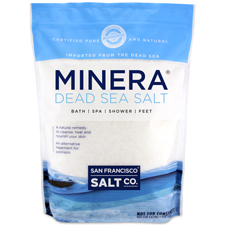 Add a handful of Minera® Dead Sea Salt to a foot bath for a relaxing foot soak. Massage feet for extra relief. For an exfoliating body scrub, mix equal parts of Minera® Dead Sea Salt with olive oil or body wash and gently massage it into your skin. Rinse thoroughly while remaining careful not to slip in the shower. Include Dead Sea Salt as a layering product in a body wrap. Mix a pinch of Minera® Dead Sea Salts into your preferred facial cleanser for a deep-pore cleansing. Helps to reduce the size of blackheads. Mix equal parts of Minera® Dead Sea Salt and shampoo and thoroughly massage into the scalp. Let the shampoo and Dead Sea Salt sit in your hair for at least 10 mins to get the full effect. Repeat every time you shower. Dissolve a handful of Minera® Dead Sea Salts into a bowl of steaming hot water and drape towel over head and around bowl; your face should be 12 - 18 inches above the surface of water. Try to relax and breathe in deeply through your nose and out through your mouth. Taking a hot bath with Minera® Dead Sea Salts and allowing the steam to collect in the bathroom will also have a similar effect. Note: Always rinse treated area with fresh water after each Dead Sea salt usage. *Psoriasis Treatment Soaks - As with all therapy programs, please consult a physician before using.